Desa over at “Desa’s Dishes” talks tea cookies (with a nice nod to Spacetrawler’s “delightful side plot”). That’s it. I’m going to spend the week drawing, maybe baking some cookies as well. You’ve likely tipped your mailman, trudging through the snow. Your waiter, helping them through college. Have you remembered your tirelessly updating webcartoonist, helping with their groceries? As thank you (or incentive?) 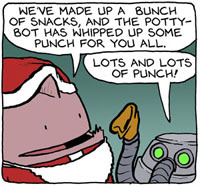 for holiday tips, I have made a very fun 17 panel holiday comic of your beloved Spacetrawler cast. After donating ANY amount (recommendation, $2-$5) through paypal (below) it will then forward you to the secret page (contact me if there are any problems). Regardless of tips or not, thank you all for the support of me and my comics. For some value of “fun”. Eebs place a high value on “fun”. I think Red-9 is about to learn a few things about parenting. I almost feel sorry for him. Is there a reason Red-9 can’t just Eeb away the workers’ brain clamps? Sabreur, it seems the only thing unclamped eebs lack is the ability to delay gratification in order to enact longer term nefarious plans… Something humans of course excel at. The worst case scenario for the GOB is probably an eeb-human alliance with more yuri type hybrids being “uPlifted”. In the end it probably wouldn’t end well for anyone. Maybe this is why Martinas dad isn’t shocked to see a fish alien… Mayhem has already began. @Xenon: Maybe. I’m not really seeing the whole “humans excel at delayed gratification thing”. Mostly, I’m just thinking about the time I spent an entire Forth of July blowing up fire ant nests with my Dad and getting into firecracker fights with my sister (who has an impressive throwing arm, btw). Deep down, I think every human secretly enjoys seeing things explode. Couple that with getting on friendly terms with a race that can cause mayhem with their minds, and I really don’t see it ending well for anybody involved. … be awesome to watch, though. Pretty horrifying curse, when you think about it. Especially when it came true. Seasoned Greetings, and Happy Hollandaise! 10 bucks that a Ebb kills Martina. You know, to make it realllly dark.